Cats love adventures, this collar is designed for your cat’s safety. Made from a soft yet durable nylon, the collar will not rub against your cats neck making it extra comfy. 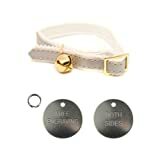 This entry was posted in Uncategorized and tagged 22mm, Ancol, Back, Collar, Engraved, Felt, Nickel, Silver by One Boutique. Bookmark the permalink.